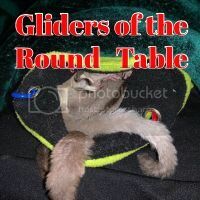 I go to phototherapy three times a week, and standing there for thirty minutes a day in the silence got me wondering about how my gliders feel being left in the quiet all the time. So I started leaving my pandora radio on set to the "Calm Meditation Radio" station. It's like classical, relaxing, simple music with little to no words and lots of natural sounds like water and leaves rustling. In the past week, I've left it on any time I'm leaving the house, and while I sleep. My husband said he likes that he wakes up to the happy noises, both from the radio station and from the cage! So this morning, I woke up early to see for myself and sure enough, they're in there talking about all sorts of things with each other. I was sneaky, so I'm sure they didn't talk just because of me. I think it's the music. During the day, when I'm in here, I turn the music off. They talk a lot more when they are awake now. If I go to pester one of them into waking up to get into a pouch or to be pet for a few minutes, they boop and click to me :D Has anyone else discovered this? I always have music and sounds going on in the glider room 24/7. During the day, Classical music plays and at night, they get crickets. I don't know whether it helps or does anything, but it sure doesn't hurt. Hah! The crickets are a nice touch. Well, believe it or not, there have been a few times when I've forgotten to change it over to crickets. Bandit barks and barks. If I go down and change it, he stops. I dare someone to tell me they aren't smart LOL. They're very smart! Have you seen how well they train humans?! And multiple tricks too! Amazing! Last edited by norton33; 05/23/12 09:32 AM. I have a radio playing 24/7 in my glider room. What other kinds of music do they like besides classical and nature sounds? I play a Mix radio station. The only time I have music on around my girls is when I am getting ready to go somewhere I listen to country in the morning and my girls love it and when I am in the car going somewhere I usally have 104.5 or 103.7 on and as I commeneted on another post it takes my girls a long time to go to sleep but when they are in the car with me and the radio is on they go right to sleep. My little ones calm down instantly when I sing to them! Add in one extremely adorable baby boy and a loving husband!